Achieve Business Growth – Macleod & Co. I was a business owner for 10 years. Want to take a guess at my most difficult task? Not billing, not interacting with clients…not even the work. The most difficult task was making time to plan for business growth. I spent so much time and energy keeping up with all of the tasks that come with running my business, I never took time to think about a strategic plan for growth. I know I’m not alone in this, but at the time, I felt alone. I felt like I was the only one who cared if my business thrived or not. I was isolated and frankly, I was in over my head. Since then, I have gone to graduate school and spoken extensively with many other business owners. What I learned from those experiences was that my feelings of isolation, along with my lack of time and energy to strategize and plan for business growth, are two very common (and related) problems for business owners today. But what should I have done differently? What should you do differently today? First ask yourself: will I be open for business in one year? If I don’t do anything differently, will I still have clients knocking on my door? If you were very lucky, you didn’t need to do much to get clients when you first started your business. Like me, you started with your friends, and they told their friends, and your business grew. You are in a great position, so you don’t have to do anything to keep the business going, right? No! This is a mistake. The market will shift, and in just a matter of time, someone smarter and cheaper than you will drive you out of business. Business owners have to take the time to think like their competitors. Think about how the market might shift, how you can be prepared, and even one step ahead—so you don’t lose customers to your competitor. You need a plan for business growth. Not just how to get more customers, but how you will scale your business for that growth. How will you hire and train a staff to do what you do now? If you don’t plan for growth, and how to handle it, your business will slowly die. The answer is: “Obviously not.” If you don’t have time to think about growth, you definitely don’t have time to do run your business all on your own. But, here is the key to the whole thing: You have to get off the hamster wheel of running your business and get some strategic help—it will only get worse if you continue to be isolated. You need some direction from a source that has some perspective and distance from the day-to-day tasks that you are likely drowning in. You need some help thinking about where your business should be in a year and what steps you need to take to get there. 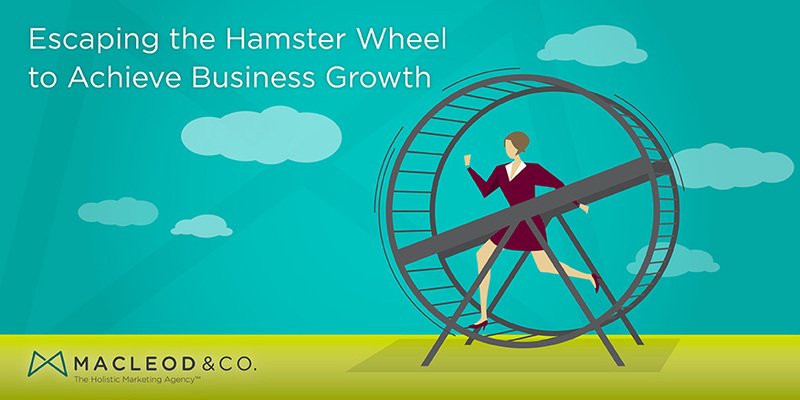 You need to step off of the hamster wheel, out of isolation, and start building a strategic business growth plan. Lastly, DON’T RE-INVENT THE WHEEL. You may have invented something unique, but nobody invented how business works. You need to continue to spend the bulk of your time and attention on your area of expertise: your business. Whether you are making widgets or crafting beer, the business of business is a thing. It already exists. You are not the only one who has gone through this and you are wasting your valuable time if you are trying to re-invent the business wheel. You don’t have time to stop running your business to come up with all the answers. You just need a little help. Macleod & Co. is the Holistic Marketing Agency™. Our goal is not just to create a great marketing campaign for your business, but to get down in the trenches alongside you as your business partner, and develop a strategic growth plan tailored to your business and your goals. With a combined 40 years of experience in marketing and business, Macleod & Co. is prepared to help you step off the hamster wheel, out of isolation, and into a proactive plan for business growth. Buckle up! Minneapolis-based Macleod & Co. is the Holistic Marketing Agency ™. We believe that in a hyper-social world, culture drives success, every employee is a customer touch point, and every customer is a broadcast network. We live at the intersection of marketing and organizational effectiveness. And we see marketing as the entire process of bringing a product, service or business from inception to maximum ongoing profitability.